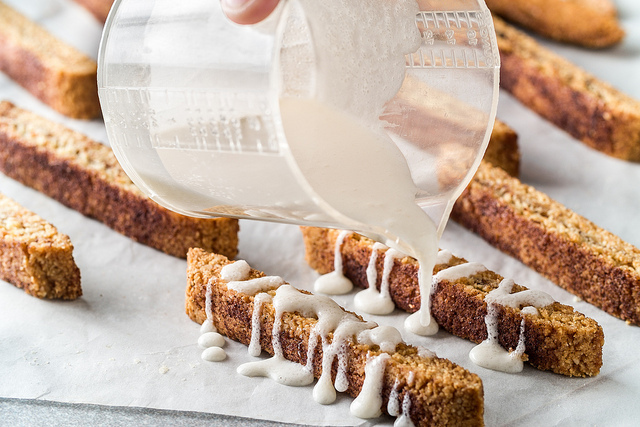 Biscotti is an old-school Italian favorite that has slowly but surely found its way onto tables of every ethnic background. They are great for dessert, or in the morning with your coffee or tea, or just to nibble on throughout the day. This particular recipe could even work as a breakfast substitute, you know, if you were in a pinch and didn’t have time to cook. You can also use some sesame seeds and raw sugar to garnish the biscotti when it is finished. In a large bowl, combine sugar, honey, tahini, vegetable oil, milk, and vanilla. Use elected mixer to combine ingredients. When ingredients are well combined, add flour, baking powder, cardamom, and salt. Continue mix until ingredients are combined. Shape loaf halves into a 4” wide and 3/4“ tall and place on lined sheet pan. Be sure to leave some space between the loaves. Sprinkle the top of the loaves with the raw sugar and sesame seeds. When biscotti is cooked, remove from oven and very gently slice with serrated knife into 1” wide slices. Lie the biscotti on its side and return to oven for additional 20 minutes. Remove from oven and allow to cool overnight. In a medium saucepan, combine coconut butter, coconut milk, raw honey, and vanilla over medium heat. When all ingredients are combined and melted, remove from heat and allow to cool for a couple of minutes. 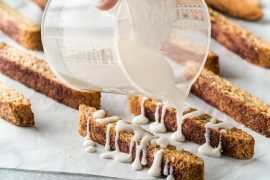 Transfer mixture into a squeeze bottle and drizzle over biscotti. As we stated before, these “cookies” are very flexible in use. Yet another idea would be to serve them as a dessert with a dipping glass of Moscato d’Asti. When we serve it like this, we like to make a nice display of the cookies with the glass of wine served in the middle of the plate for everyone to dip their cookies. Need some raw honey to make this recipe? We can get your order started right away if you click here.